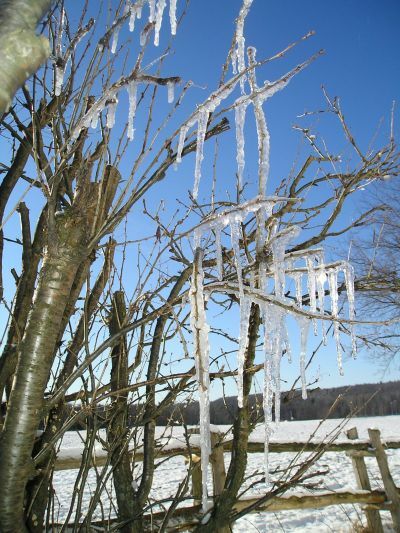 December Ice When the snow storms have passed and the sun peeks out from over The Glen we can sometimes be treated to icicles forming on the fragile fingers of the naked hedges along the fences and fields of Lac Brome. Delicate patterns are created turning the frozen branches into what appears to be glistening angel wings draped over the trees. 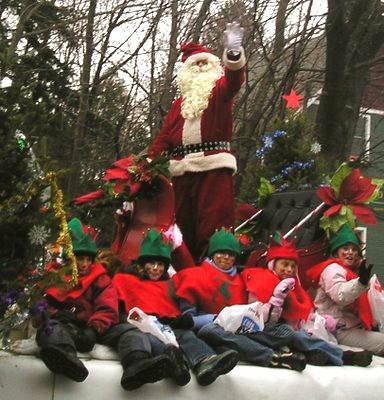 The traditional and much-loved parade through the streets of Knowlton featuring decorated floats, firetrucks, horses, clowns and all sort of Christmas fun that is very popular with kids of all ages. The parade usually starts around 1 p.m. and winds from Victoria street to Lakeside and down to Knowlton Road. The long parade route means a great vantage point can be found anywhere in town. There is free hot chocolate outside of Le Relais in the heart of Knowlton. The Santa Claus parade is sponsored by the Knowlton Lion’s Club. A tradition for the young and young-at-heart. Kids can meet Santa after the parade. The Knowlton Festival of Lights is officialy “turned-on” with the official ceremony and lighting of the town’s Chritmas lights taking place. Everyone is invited for some hot-chocolate and ginger-bread cookies to be distributed at the brightly lit gazebo in Coldbrook Park. Starts at 4:30 after the Santa Claus Parade. Pick up some tasty treats to better enjoy the holidays! Nothing says Christmas by homemade goodies baked by some of the finest cooks of the Eastern Townships! Sale starts at 10 a.m. at 130 Lakeside. The Mayor and elected offcials invite everyone to the presentation of the towns budget for 2007. The meeting is at the Legion Hall , 383 Knowlton Road starting at 7 p.m. The wonderful outdoor skating rink in the center of the village of Knowlton is available for family skating. Enjoy the magic of winter outdoors in front of the charming Mill Pond. Christmas music will be playing turning the classic Christmas majesty of Christmas in the Eastern Townships into a Victorian winter wonderland. Bring your hot-chocolate and the whole family to ColdBrook Park on Lakeside near Knowlton Road. 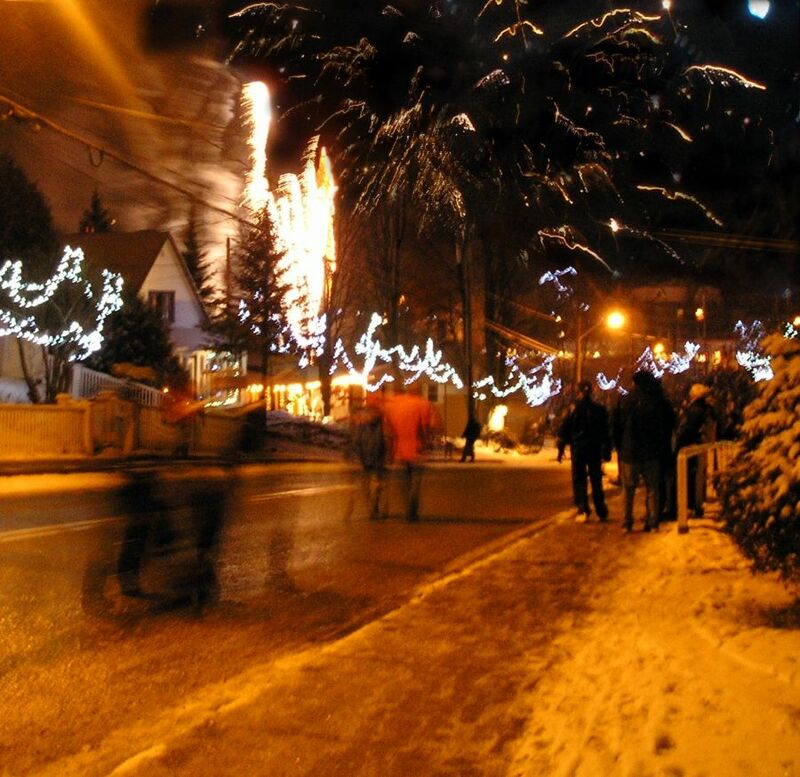 As part of the month long Festival of Lights the village is tentatively planning a fireworks display. Stay tuned for the official word on the display. If it does go ahead it will be a spectacular light show with the snowy trees and oce on the lake serving as a wintery canvas for the multi-colored lights. Bring a chair and a thermos of eggnog! Author and journalist will be signing his new book “This is my Country, What’s Yours” and will be speaking at Arts Knowlton. Don’t miss this wonderful opportunity to meet and hear the thoughts of a wonderful Canadian writer. January 4th, 5th and 8th from 10 a.m. to 1 p.m. The Winter semester will be starting soon and now is the time to register for the classes. There are credit courses offered such as: Drawing & Painting in Guatamala Art History, Drawing (Level 1, 2 and 3 ) Photography 2, Sculpture, Italian Language 2, and Opera(!). There are also non-credit courses offered like French Conversation and a round table fiction discussion. Nore information can be had by calling 450-242-1518. Sunday December 3rd at 5 p.m.
Joyeux Noel L’absurdite de guerreDecember 17th: Joyeux Noel (Merry Christmas) Nominated for Golden Globe for best Foreign Film of 2006 and for the Oscar of Best Foreign Film 2006. December 1914. World War I is not even five months old, and already the high spirits with which it started are eroding. Generals and leaders still voice the opinion that it’s going to be a short war, but the men in the trenches doubt this. Yet, following days of bloodshed and in advance of a brutal struggle of attrition that will lead to millions of deaths, there is a brief respite when all truly is quiet on the Western Front. For Christmas Eve and Christmas Day in 1914, enemies ceased their hostilities and acted toward each other as comrades trapped in the midst of the ultimate, tragic absurdity. This story, based on true events, is what Joyeux Noel relates. With Christmas in the Eastern Townships right around the corner why not let someone else do all the baking for you! The BCHS is having their annual bake sale starting at 10 AM at the Museum at 10 Lakeside. There are always cakes, cookies, special Xmas goodies and unusual homemade treats to buy for the holidays! The St. Eduard School is also having a Christmas Sale from 10AM to 4PM at the school on Knowlton Road. Another chance to do some homegrown shopping without driving to the mall! Those hilarious and happy folks of the good humor club are back at it again having their annual Christmas supper and dance. The event starts at 5:30 PM and for more info you can contact 450-243-1012. The Knowlton Gallery is having a special show and sale until December 31st, 2007 featuring paingintgs, sculptures and other original works in a smaller format. Perfect for gifts and those of us on smaller budgets the Small Formats show is a great chance to own some unique pieces at an affordable price. The Gallery is in downtown Knowlton at 285 Knowlton Road. The Gallery was recently chosen as the prize winner in the Arts & Culture category of the Brome-Missisquoi Gala of Excellence. A gala fundraiser will take place on Thursday December 27th at the Brome Lake Community Center on Victoria Street in Knowlton. The popular Knowlton theatre is raising funds to help with their upcoming productions…they will also be announcing the 2008 theatre program at the gala. Come and support the local arts community and their continuing efforts to bring us some wonderful comedies, dramas and musicals. Tickets for the event are only $150 and all net proceeds will go to support the theatre. For more information and tickets call Martha Fielding at 450-243-1425. Buy your Christmas gifts at Arts Sutton Gallery! This year, Arts Sutton is transforming one of its two annual members’ shows into a Christmas Market where all the works exhibited will be small, and prices will not go over $200. Some 30 artists from Sutton and the region have confirmed that they will be participating in this Exhibition and sale, which will include paintings, watercolours, pastels, ink drawings, digital prints, books, stained glass, sculptures, collages and mixed media. Some of the exhibitors are already well known to art lovers in the region, while others hope to make their first sale! The Sutton Gallery is extending its hours and will be open every day from December 13 – 22, from 11 a.m. to 5 p.m. The show will continue after the Christmas break, from January 3 – 13, 2008. The Exhibition-Sale opens on Saturday, December 15 at 2 p.m. and everyone is welcome. Curator: Brigite Normandin. Arts Sutton is at 7 Academy in downtown Sutton, not far from Knowlton, and info can be had by calling 450-538-2563. “Downtown Knowlton will once again be transformed into an idyllic, magical winter wonderland with its streets and buildings lit by 3,000 m of energy saving LED lights”, said Andrea Reid, General Manager of the Chamber. “Knowlton will be lit up by more than 30,000 lights” she added. The event has become an attraction for local families as well as for visitors throughout the whole winter season. During the course of the evening as well as on some special days, discreet holiday music will be played. The Chamber wishes good shopping to all visitors and residents alike. The Chamber of Commerce of Lac Brome would like to thank the sponsor of this event, Hydro Quebec, as well as the Town of Brome Lake and the hard working volunteers for assistance in installing all the lights and sharing in their warm community spirit during the winter months.